Daylily problems used to be rare, but during the past 10 years daylilies have been affected by two new fungus diseases, one serious (rust) and one not so serious (streak). It is easy to confuse the symptoms of the two diseases, so it is helpful to know the differences. If you suspect fungal disease, be sure to inspect your daylily plants often during the growing season. 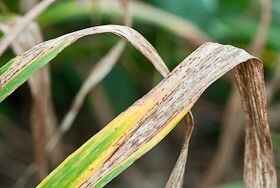 Fortunately, daylily streak, the less serious of the two diseases, is the one you are most likely to run into. Streak is a fungus that causes plants, especially the leaves turn brown and ugly after blooming, but it doesn’t do permanent damage to the plants. The pathogen is a fungus called Aureobasidium microstictum. Plants with this disease get bright yellow streaks along the leaf in the middle where there is a vein. The streaks develop from late spring to mid-summer. The center of the streak will turn brown and brown bands surround the yellow streak. This is followed brown spots with yellow halos and reddish flecking on the leaves. 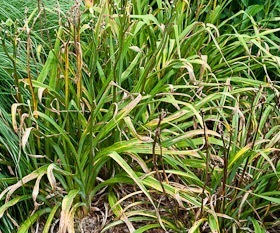 The entire plant begins to look brown and sick after flowering, and the leaves wither and die. How the disease spreads: The fungus overwinters in the plant’s dead leaves. In the spring, spores are active during wet, humid weather and new leaf growth is infected as it emerges through the past season’s dead leaves. By early summer infected leaves shed spores that move via the breeze to infect other daylilies. This spore cycle continues all summer. How to control: Cut brown leaves off to the ground and get rid of the leaf debris to remove the source of spring infection. Trash or burn the leaves. Do not compost. If your plants are overcrowded, divide them in spring. Overcrowded plants tend to develop disease symptoms earlier in the season. Fungicide products that contain sulfur, azoxystrobin (Heritage) or chlorothalonil (Daconil or Pathguard) applied in the spring can help to protect new foliage from infection. Resistant daylilies: Many cultivars seem to have a natural resistance to daylily problems such as streak. Your best bet is to keep an eye out for daylilies that look good all season. Look at plants in public gardens and around your neighborhood. If your plants still don’t look good after you have tried preventative measures, replace them. With thousands of cultivars to choose from, there is no reason to put up with have sad-looking daylilies year after year.